Note: don't buy the family-sized KitKat bars, which tend to have shorter fingers. The top of the cake could be filled with M&Ms or any other small candy or cookie (try chocolate Teddy Grahams!). Made with a base cake from Add a Pinch. 1Preheat the oven to 350F and butter two 8" or 9" round cake pans. 2In a large bowl, whisk together the flour, sugar, cocoa, instant coffee, baking powder, baking soda and salt. Add the milk, oil, eggs and vanilla and whisk or beat until well blended; gently whisk or beat in the boiling water. 3Divide the batter between the pans and bake for 30-35 minutes, until the tops are springy to the touch. Transfer to a wire rack to cool completely. 4To make the frosting, beat the butter and cocoa until smooth; gradually beat in the icing sugar and milk, adding a little extra milk if needed to achieve a fluffy, spreadable consistency. Spread on top of one layer, then place the second layer on top and spread the entire outside of the cake with frosting. Break the KitKats in half and place in twos around the entire outside of the cake. 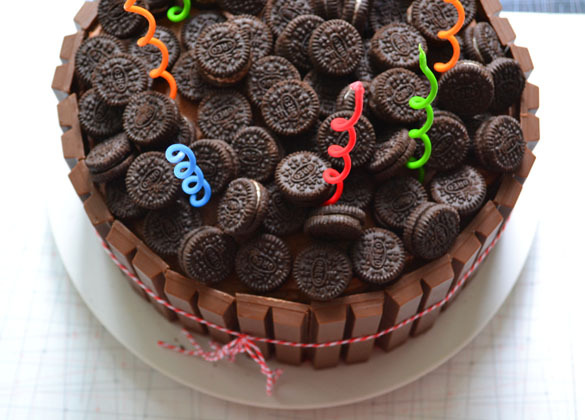 Fill the top with mini Oreos or other candies.